I was driving along in my car recently and someone I hadn’t thought of in a long time popped into my head. This wasn’t just any old ‘someone’, but someone who was once so close to me that he and I used to call each other brother and sister. We did this not because we are related by blood, but because trying to explain our relationship to people was too hard. We were more than friends. We were even more than best friends. We were BFFs…… we thought. I don’t know exactly where it went pear shaped, there was no singular event, but I do remember the time in our lives, and it was complicated for the both of us, to say the least. We were living together, but our lives were very separate. We were both engrossed in our own stuff and I guess we needed some space. There’s space, and then there’s SPACE, because as I was driving along I realised that this man – that I once called my brother – did not know that I was married to a red-head, with whom I was set up on blind date. He would think that was funny. He did not know that I had a son with beautiful, deep grey eyes and a cheeky smile, and neither did he know that I had a daughter, named after my great-grandmother. I had no idea where he lived, or even if he lived, and I was suddenly filled with profound sadness at this thought. As soon as I stopped driving I called his phone, hoping he had the same number. I got voicemail, of course, what an anti-climax, and I left a message just saying I was thinking about him, and maybe we could talk if he wanted to. I left it in his court, but at the very least I wanted him to know that he was in my thoughts. I didn’t hear anything for a few days, and then I got a text. Maybe he wasn’t ready to talk, just yet. Maybe he needed to see if we still had rapport? After a few tentative texts back and forth, I invited him over for lunch, and I’m so thrilled that I did because it was just like old times. Friendship is a funny thing, isn’t it? How someone, with whom you were once invincible, suddenly doesn’t fit, and then perhaps down the line you do fit again. Or you fit differently but it’s still nice. I strongly urge you to call someone today, someone you let slip away, and just tell them you’re thinking of them. You don’t need lunch or a grand gesture. 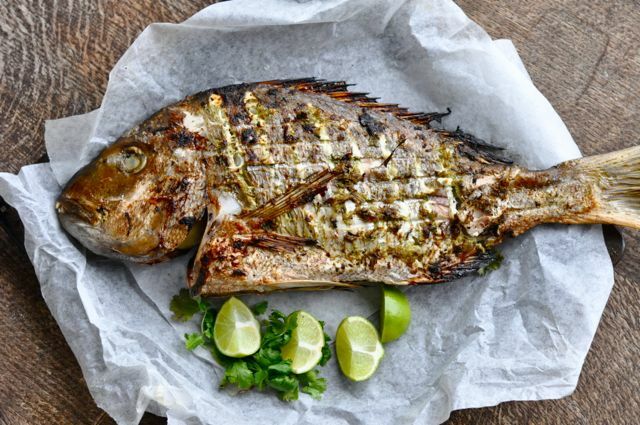 I wanted to BBQ a whole fish this Spring, and this lunch seemed the perfect occasion. He was a 2 kilo snapper, and he was delicious. 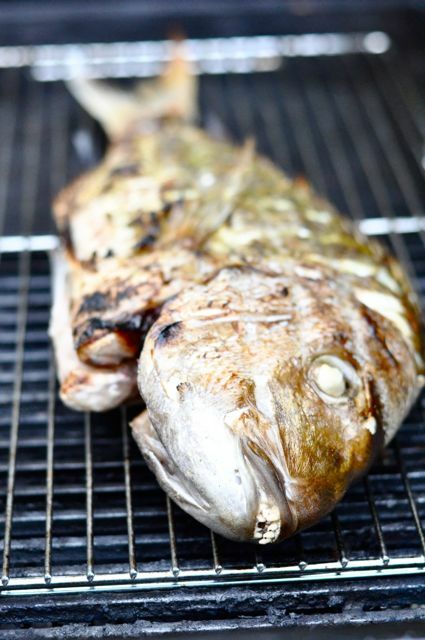 I was hoping to BBQ a fish that I had never cooked before but when I was at the fishmonger, Steve was winking at me and I couldn’t resist his fishy goodness. 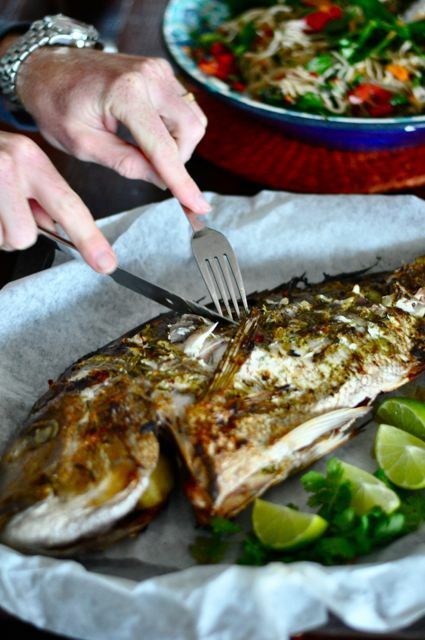 Score your fish deeply in the sides to allow for the marinade to penetrate. 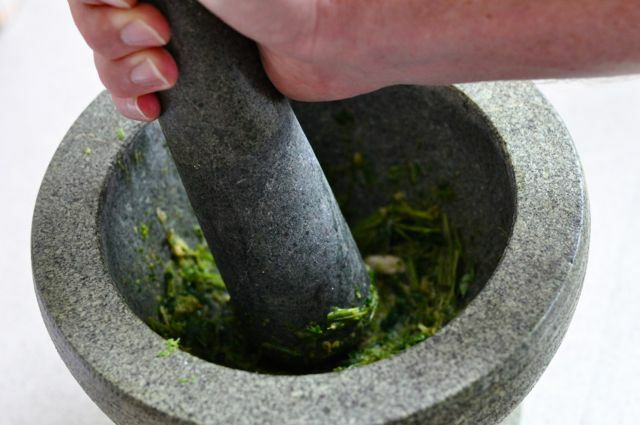 In a mortar and pestle (or small food processor) add everything except the olive oil and pound until it forms a paste. Add your oil and stir to combine. 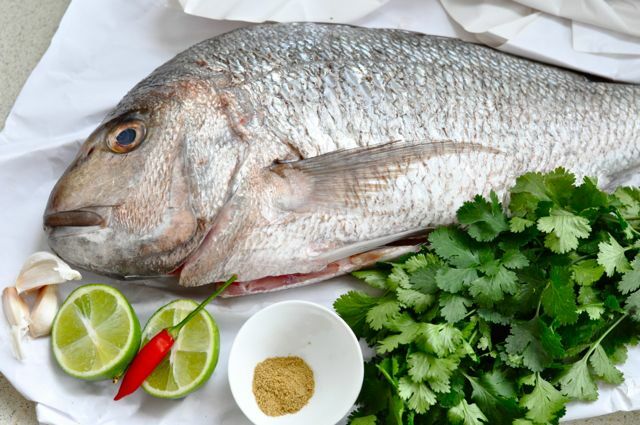 Rub mixture all over your fish, and put empty lime husks inside. Refrigerate for at least 40 minutes for let the flavours infuse. Our fish BBQ cage thing was too small to accommodate Steve so we got a little creative and sandwiched him between two cake racks. He didn’t know the difference and it just kept him over the heat instead on directly on it. We did a little lid up, and then a little lid down action, cooking each side for about 20 minutes. He was pretty fat, so you’ll need to adjust according to the fatness of your fishy. I really think that BBQing anything makes it yummier, and Steve was no exception. I served him with a soba noodle salad, but you could eat this with rice and Asian greens, or stir fry, or even potato salad if it takes your fancy. I have a friend who I’ve known for 27 years. Our paths crossed and diverges many times over the years. He lives overseas but when he comes to visit it is like he never left. We chat on the phone every couple months and our conversations end when one of us runs out of credit on Skype, always leaving our chat hanging midsentence. There are always lots of I-love-you’s and I-miss-you’s but very seldom goodbyes. It is like our friendship is paused in that moment were you take a breath just before you say something profound. He is the brother of my heart and no matter how far apart our lives take us, we always manage to find our way back eventually. Time doesn’t matter in a friendship like that. I hope you find your brother well and waiting to pick back up with your friendship. I think we are totally going to pick up where we left off……things are looking good thus far. Great recipe for fish in general … I don’t recognize the fish. My wife says it looks like the one that people (inaccurately) call dolphin… are we close? Um, no. Not dolphin. 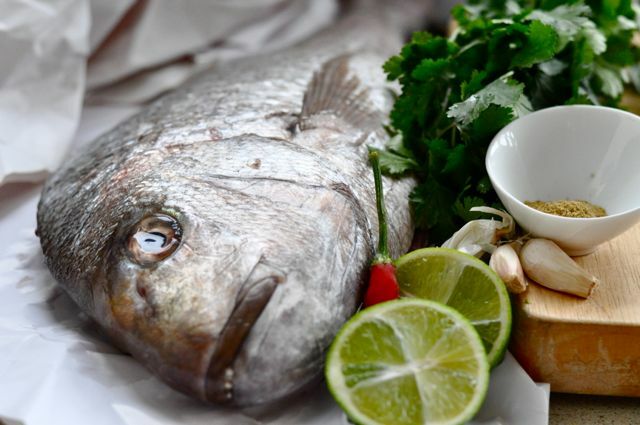 We call it snapper. Very common in Australia. Not sure what your equivalent would be. Fleshy, mild fish. I love the Thai flavours you have going on here. Steve likes Thai? I can’t say I’m very good at phone conversations, but I love when old friends come back into my life and it’s all the same as it was. I think the best friends are the ones where it seems like you simply pick up mid-conversation, even though many years have passed…natural and effortless! And I’m salivating just looking at that snapper. I have been thinking about my friend a lot lately, she was my best friend, bridesmaid at my wedding but unfortunately things happened and we are not in touch anymore.. I miss her terrible and you have now given me the push to send her an email, hopefully in time we can meet up again.. This was a very moving piece! I too have been struggling recently with a friendship that I really don’t want to lose. I have been trying everything under the sun to maintain it. The best thing I have found that has really opened my eyes to the importance of keeping friends for the long haul is Women I Want to Grow Old With. It’s authors make so many good points that I had never thought of. We never know when we will need our friends, but we do need them! womeniwanttogrowoldwith.com is where I found it if anyone wants to take a look at it! Thanks again for this post, i needed to read it today! I’ve heard of that book, thanks for the recommendation! I think friendships will always have some ebb and flow….. Thanks so much for commenting. I’m pleased this resonated with you. Don’t give your kids your insecurities…..in fact, just ditch them all together.